A greenhouse (also called a glasshouse, or, if with sufficient heating, a hothouse) is a structure with walls and roof made chiefly of transparent material, such as glass, in which plants requiring regulated climatic conditions are grown. These structures range in size from small sheds to industrial-sized buildings. A miniature greenhouse is known as a cold frame. The interior of a greenhouse exposed to sunlight becomes significantly warmer than the external ambient temperature, protecting its contents in cold weather. The concept of greenhouses also appeared in the Netherlands and then England in the 17th century, along with the plants. Some of these early attempts required enormous amounts of work to close up at night or to winterize. There were serious problems with providing adequate and balanced heat in these early greenhouses. The first 'stove' (heated) greenhouse in the UK was completed at Chelsea Physic Garden by 1681. Today, the Netherlands has many of the largest greenhouses in the world, some of them so vast that they are able to produce millions of vegetables every year. 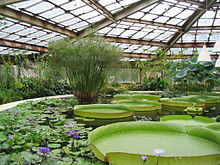 The French botanist Charles Lucien Bonaparte is often credited with building the first practical modern greenhouse in Leiden, Holland, during the 1800s to grow medicinal tropical plants. Originally only on the estates of the rich, the growth of the science of botany caused greenhouses to spread to the universities. The French called their first greenhouses orangeries, since they were used to protect orange trees from freezing. As pineapples became popular, pineries, or pineapple pits, were built. Cooling is typically done by opening windows in the greenhouse when it gets too warm for the plants inside it. This can be done manually, or in an automated manner. Window actuators can open windows due to temperature difference  or can be opened by electronic controllers. Electronic controllers are often used to monitor the temperature and adjusts the furnace operation to the conditions. This can be as simple as a basic thermostat, but can be more complicated in larger greenhouse operations. The possibility of using carbon dioxide enrichment in greenhouse cultivation to enhance plant growth has been known for nearly 100 years. After the development of equipment for the controlled serial enrichment of carbon dioxide, the technique was established on a broad scale in the Netherlands. Secondary metabolites, e.g., cardiac glycosides in Digitalis lanata, are produced in higher amounts by greenhouse cultivation at enhanced temperature and at enhanced carbon dioxide concentration. Carbon dioxide enrichment can also reduce greenhouse water usage by a significant fraction by mitigating the total air-flow needed to supply adequate carbon for plant growth and thereby reducing the quantity of water lost to evaporation. Commercial greenhouses are now frequently located near appropriate industrial facilities for mutual benefit. For example, Cornerways Nursery in the UK is strategically placed near a major sugar refinery,  consuming both waste heat and CO2 from the refinery which would otherwise be vented to atmosphere. The refinery reduces its carbon emissions, whilst the nursery enjoys boosted tomato yields and does not need to provide its own greenhouse heating. Greenhouses are often used for growing flowers, vegetables, fruits, and transplants. Special greenhouse varieties of certain crops, such as tomatoes, are generally used for commercial production. Many vegetables and flowers can be grown in greenhouses in late winter and early spring, and then transplanted outside as the weather warms. Bumblebees are the pollinators of choice for most pollination,[ citation needed] although other types of bees have been used, as well as artificial pollination. Hydroponics (especially hydroponic A-frames) can be used to make the most use of the interior space. Greenhouses began to be built in the Westland region of the Netherlands in the mid-19th century. The addition of sand to bogs and clay soil created fertile soil for agriculture, and around 1850, grapes were grown in the first greenhouses, simple glass constructions with one of the sides consisting of a solid wall. By the early 20th century, greenhouses began to be constructed with all sides built using glass, and they began to be heated. This also allowed for the production of fruits and vegetables that did not ordinarily grow in the area. 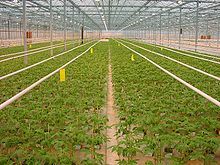 Today, the Westland and the area around Aalsmeer have the highest concentration of greenhouse agriculture in the world. [ citation needed] The Westland produces mostly vegetables, besides plants and flowers; Aalsmeer is noted mainly for the production of flowers and potted plants. Since the 20th century, the area around Venlo and parts of Drenthe have also become important regions for greenhouse agriculture. Since 2000, technical innovations include the "closed greenhouse", a completely closed system allowing the grower complete control over the growing process while using less energy. Floating greenhouses[ clarification needed] are used in watery areas of the country. ^ Janick, J; Paris, HS; Parrish, DC (2007). "The Cucurbits of Mediterranean Antiquity: Identification of Taxa from Ancient Images and Descriptions". Annals of Botany. 100 (7): 1441–1457. doi: 10.1093/aob/mcm242. PMC 2759226. PMID 17932073. ^ Yoon, Sang Jun; Woudstra, Jan (1 January 2007). "Advanced Horticultural Techniques in Korea: The Earliest Documented Greenhouses". Garden History. 35 (1): 68–84. doi: 10.2307/25472355. JSTOR 25472355. ^ Tewolde, FT; Lu, N; Shiina, K; Maruo, T; Takagaki, M; Kozai, T; Yamori, W (2016). "Nighttime Supplemental LED Inter-lighting Improves Growth and Yield of Single-Truss Tomatoes by Enhancing Photosynthesis in Both Winter and Summer". Front Plant Sci. 7: 448. doi: 10.3389/fpls.2016.00448. PMC 4823311. PMID 27092163. ^ Wittwer, SH; Robb, WM (1964). "Carbon dioxide enrichment of greenhouse atmospheres for food crop production". Economic Botany. 18: 34–56. doi: 10.1007/bf02904000. ^ Stuhlfauth, T.; Fock, HP (1990). "Effect of whole season CO2 enrichment on the cultivation of a medicinal plant, Digitalis lanata". J. Agronomy & Crop Science. 164 (3): 168–173. doi: 10.1111/j.1439-037x.1990.tb00803.x. ^ Stacey, Neil; Fox, James; Hildebrandt, Diane (2018-02-20). "Reduction in greenhouse water usage through inlet CO2 enrichment". AIChE Journal. 64 (7): 2324–2328. doi: 10.1002/aic.16120. ISSN 0001-1541. ^ Cook, BI; Ault, TR; Smerdon, J. E. (12 February 2015). "Unprecedented 21st century drought risk in the American Southwest and Central Plains". Science Advances. 1 (1): e1400082. doi: 10.1126/sciadv.1400082. PMC 4644081. PMID 26601131. ^ Xiao, J; et al. (Apr 2011). "Assessing net ecosystem carbon exchange of U.S. terrestrial ecosystems by integrating eddy covariance flux measurements and satellite observations". Agricultural and Forest Meteorology. 151: 60–69. doi: 10.1016/j.agrformet.2010.09.002. ^ Famiglietti, J; Rodell, M (14 June 2013). "Water in the Balance". Environmental Science. 340 (6138): 1300–1301. doi: 10.1126/science.1236460. PMID 23766323. ^ Schlesinger, W.; Lichter, J. (24 May 2001). "Limited carbon storage in soil and litter of experimental forest plots under increased atmospheric CO2". Nature. 411 (6836): 466–469. doi: 10.1038/35078060. PMID 11373676. ^ Phillips, R.; Meier, I.; et al. (2012). "Roots and fungi accelerate carbon and nitrogen cycling in forests exposed to elevated CO2". Ecology Letters. 15 (9): 1042–1049. doi: 10.1111/j.1461-0248.2012.01827.x. PMID 22776588.